Aspire Australia is a company that assists people in obtaining the correct visas to work and live in Australia and are recognised as migration experts. 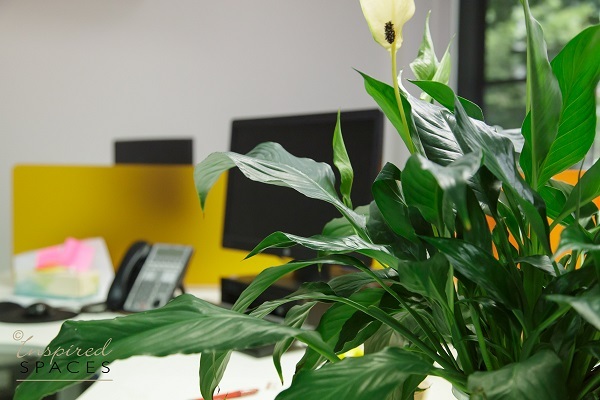 The company had not only outgrown its initial office space it did not represent their brand as being professional and here for the long term, it did not instil confidence in a visitor. A very important aspect of branding that business’ often overlook especially when in start-up mode. Arriving at the original office for my initial meeting, I walked in and immediately felt as though I was invading the privacy of the staff working there, there was no sense of entry or even an indication I was in the correct space. Originally the plan was to update the existing space, but it soon become obvious that this was not feasible both from an investment point of view and for staff expansion, as the company is growing quickly and at a very fast pace. 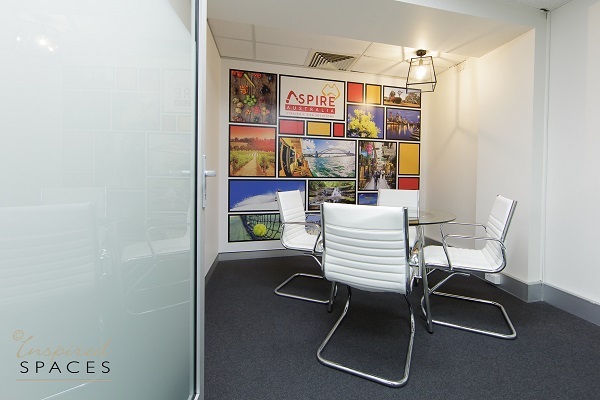 Aspire than decided to look for new premises and although it delayed the branding upgrade, it was a very wise decision as the new office space allows for a reception area, private meeting room, private office for the CEO, workstations for 6 staff and a break out area for down time. Inspired Spaces worked with Sarah from Aspire (read her testimonial), to understand her brand, company ethos and company structure. 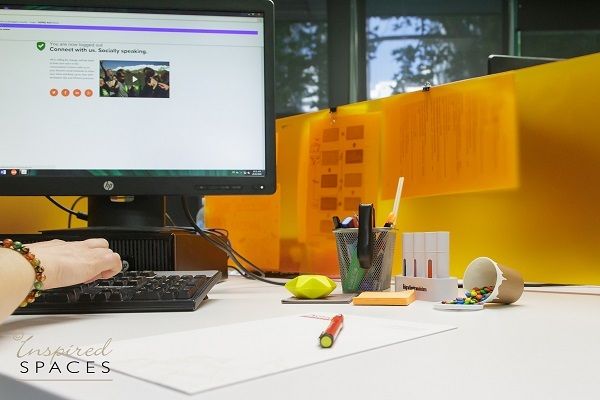 As she did not require a receptionist it meant the reception area needed to be seen by a staff member in the back-office area, which influenced the location of this workstation. 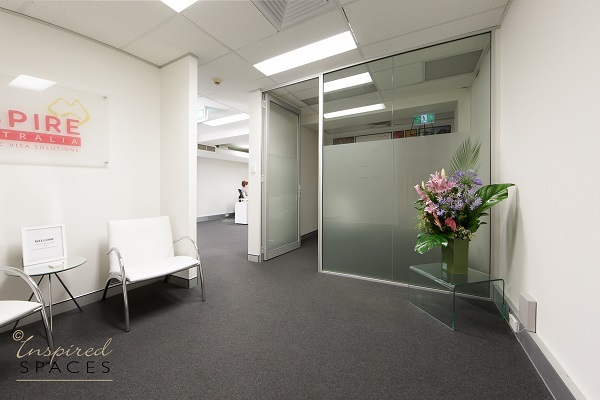 The need for a meeting room to discuss clients’ sensitive issues in private was paramount and at the same time needed to reflect the lifestyle of Australia. The custom designed wall paper by the principal designer of Inspired Spaces, Robyn Hawke was created using the concept of Mondrian art and the corporate colours of Aspire. Again, Inspired Spaces worked carefully with Aspire to determine what it was that they wanted to represent about Australia. 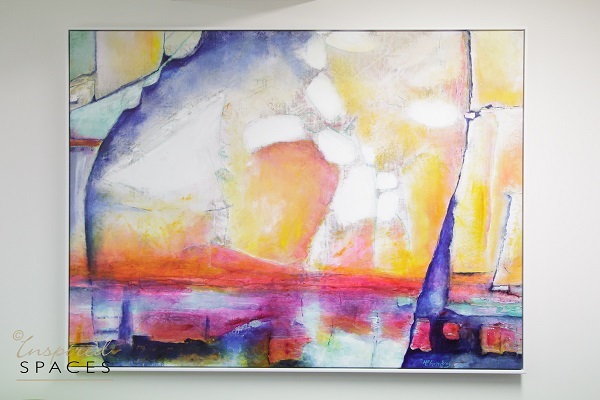 As part of the process, Inspired Spaces sourced all images to create the overall effect. 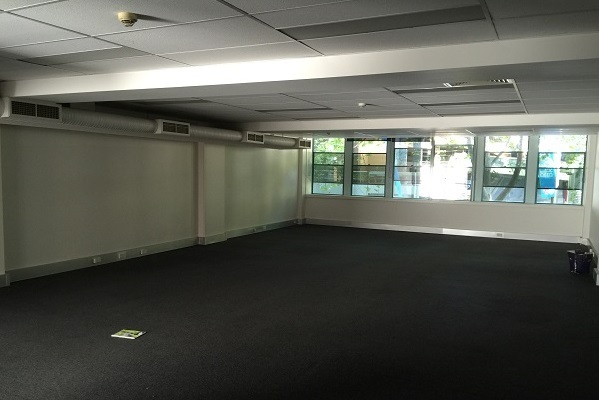 The new space was a clean slate; however, several constraints were placed on the design process, that being the air conditioning vents and equipment, they initially did not meet current BCA standards and Inspired Spaces had to work with certifiers to rectify this issue. The low head space of this area meant that offices needed to be located on the other side of the room, limiting design options, however the final solution ticked all the functional boxes as well as the aesthetics. 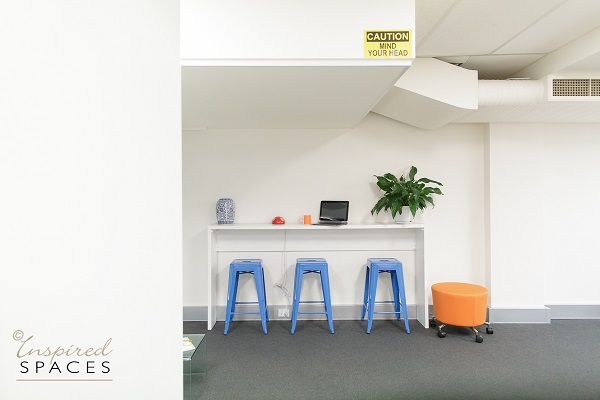 Sarah had seen a previous office space designed by Inspired Spaces and she wanted to emulate the bright colours and white walls to give her staff a space that was easy to work in but also fun. 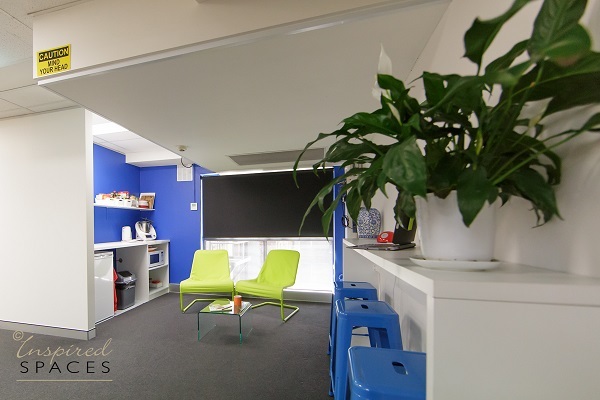 To this end the breakout area was painted in a bright blue with lime green easy chairs, with the eatery bench a space for mindfulness with colouring in books and pencils. Details such as a phone and battery charger also enhance the functionality of the space. 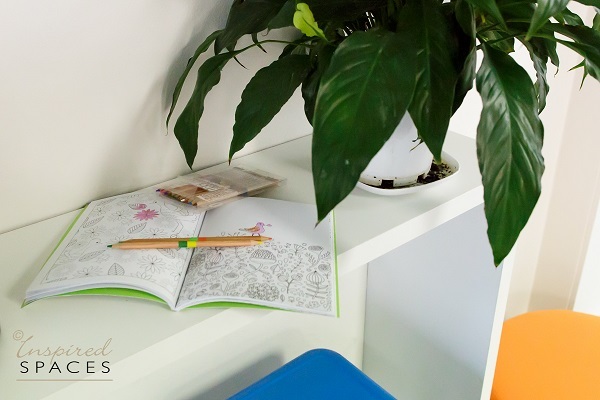 The colour palette in this area differentiates itself from the other zones and adds a sense of fun. The open kitchenette allows ease of access and convenience for making that cup of coffee or toasting your sandwich. 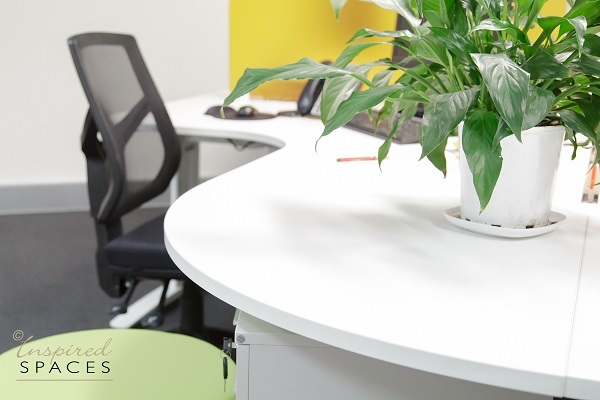 The workstations were configured in a curve to create privacy for each staff member and to add interest, a break away from the standard back to back, lineal arrangement. The corporate orange colour was used as the privacy dividers. 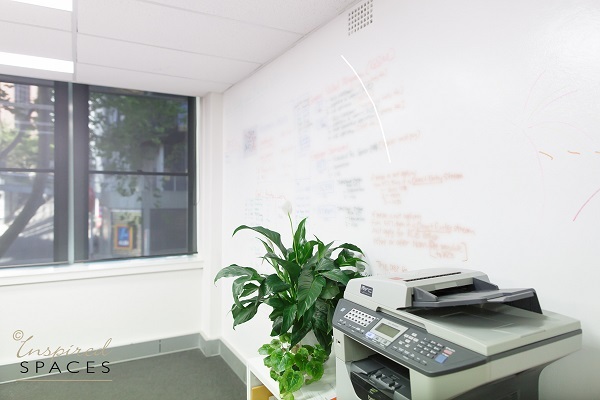 To assist in the everyday functioning of the space, an entire wall was made into a white board where daily and monthly goals are written, and staff with ideas or issues can jot them on the wall as they think of them. 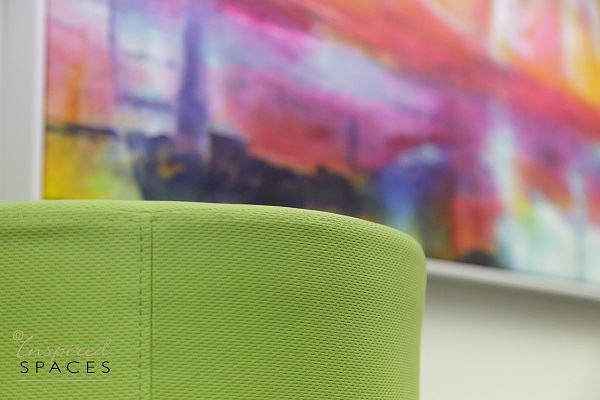 The fun ottomans in the green and orange allow for informal meetings in front of this wall. To complete the space, a custom design artwork was commissioned by international artist Kirana Haag to make the space a light filled, colourful, fun and cohesive space. Kirana also worked with both Sarah and myself to understand the concept of the design and the ethos of Aspire Australia. The result is stunning and every time I see this masterpiece I see a different story in it, a testament to her skill. The team at Inspired Spaces do not use a cookie cutter solution for its designs. We work carefully with the company to understand its target market, its company’s ethos and values and the structure of the company, so that relevant staff are located near applicable personnel. 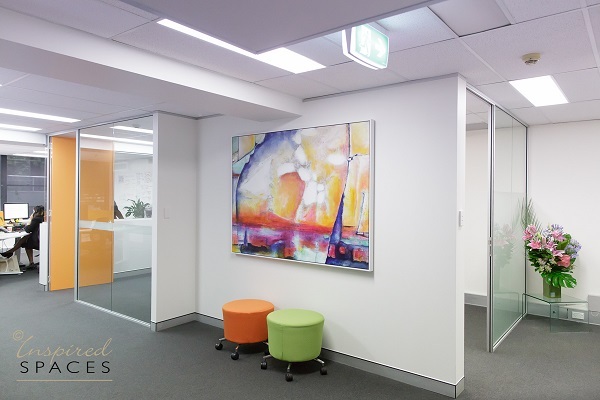 We ensure all designs are BCA and Australian Standards compliant and work only with professional trades (QVS Group were our preferred team on this project) and associated professions who have our same exacting standards. For more images of this physical rebranding please see our portfolio. 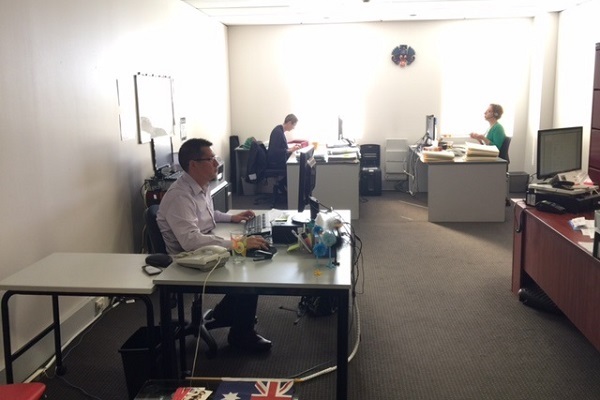 If you have questions on how to redesign your office space, please contact the team of Inspired Spaces.